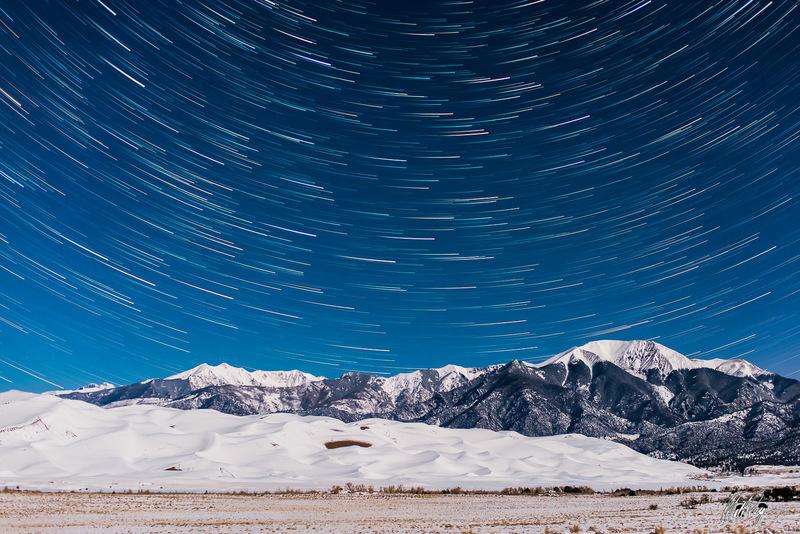 One of the most awesome places in Colorado to photograph the night sky is the Great Sand Dunes National Park.I photographed this image in January when it was -20 degrees Fahrenheit - one of the coldest nights of photography I can recall in my lifetime. The star trails created by the movement of the earth paired with the great mountainous and desert landscape of the Sand Dunes and Sangre de Cristo Mountains illuminated by the moon makes for an amazingly unique night image. Photo © copyright by Matt Payne. This is the most incredible finished product that I offer. Your fine art is carefully placed behind an acrylic glazing and another archival substrate. This is the premier presentation system for bringing detail, color and tonal range to life in a way that traditional photo framing cannot. For this presentation style, world-class polyester photographic material is used for amazing color and longevity. These works of art are Face Mounted on lens-grade optically clear 1/8″ TruLife Anti-Reflective acrylic. This revolutionary product delivers the highest-resolution viewing experience of photographic artwork available today. TruLife acrylic is also abrasion-resistant, helping preserve the life of the print. With lifelike colors, incredible depth and clarity, TruLife is the best way to show high quality art. The edges are hand polished for a crystal clear look. The Acrylic Face Mount comes ready to hang with a metal french cleat style hanging system. An acrylic face mount piece of art will look great against most any wall type. * Free shipping for all U.S. orders! Please contact me for international shipping fees. Due to the meticulous production process and availability of the high quality materials used in this acrylic artwork, please allow 6-8 weeks for production and delivery. These open edition prints are printed on beautiful Fuji Crystal Archive emulsion and sealed between solid aluminum and an amazing high-gloss UV protective laminate. Not to be confused with Dye Sublimation Metal Prints that print directly to aluminum, this is a real chromagenic latent print placed behind a carefully sourced ultra-glossy UV laminate and mounted on thicker, stiffer aluminum sheets. The level of detail in this print is superior to dye sublimation metal. This print offers the look of aluminum combined with all the amazing visual snap of acrylic prints – sharpness, contrast, details, etc – but it’s lighter and less expensive. The print arrives mounted on a float system and includes hanging hardware. * Free shipping for all U.S. orders! Please contact me for international shipping fees. Please allow 2-4 weeks for production and delivery. These open edition ChromaLuxe Metal Prints are produced using Dye Sublimation technology to infuse inks into specialized aluminum plates that have been finished with a fine multiple layer polymer. ChromaLuxe’s archival qualities, image brilliance, and durability make it an excellent all-around choice. Two metal surfaces are available - a glossy surface with more pop and saturation (albeit with more glare and reflective properties), and a mid-gloss satin surface with similar color intensity and detail as the glossy option, with reduced glare. By default I print on glossy unless you indicate otherwise by contacting me. My ChromaLuxe metal prints are finished with a float mount system on the reverse and either a z-bar or wire for effortless hanging on delivery. By default we use the z-bar unless otherwise indicated via e-mail. No exterior framing is required. The process of printing on this medium can rarely result in defects in the print medium that are barely noticeable. This is not something that can be controlled in the lab. All material © copyright by Matt Payne. All rights reserved. Site by WideRange Galleries.